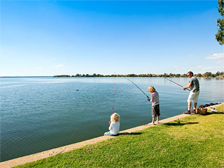 There is so much to do and see in and around Yarrawonga-Mulwala. Yarrawonga Lakeside Apartments is situated right in the heart of all the action, centrally located between the twin towns. Everything is close-by, most within walking distance! 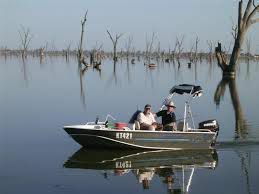 Lake Mulwala & the Murray River – offers a superb destination for all water sports, swimming, great fishing, river beaches, and scenic nature walks & bike tracks. Hire a BBQ boat for fun with family & friends, learn to ski, cruise the lake on the Paradise Queen, or just relax in this inland paradise. Golf Courses – Yarrawonga Mulwala Golf Resort featuring two 18 hole championship courses and a 9 hole executive course are a treat for all golfers. 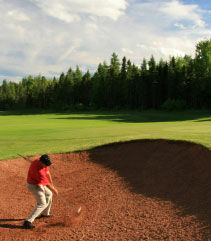 The recently opened Black Bull Links Course at Silverwoods, will be fun for players of all levels. Outstanding courses are also within easy reach at Corowa, Cobram/Barooga, Tocumwal and Howlong. The Clubs – within walking distance or catch the courtesy bus, the Mulwala Ski Club, Yarrawonga Mulwala Golf Resort and Club Mulwala, all offer fine food, free entertainment, kids activities, and pokies for those who like a flutter! Eating Out – close by are 6 pubs all with great counter meals, a variety of restaurants & bistros with Asian, French, Australian & Italian cuisine, and plenty of takeaways - no-one will go hungry! For the Kids – have fun at Tunzafun Amusement Park with mini golf, dodgem cars, mini train, trampolines and more......... or enjoy the challenge of the waterslides. Wineries – Visit one of the many regional wineries – at Rutherglen, Glenrowan, and along the Murray Valley. Learn from the winemakers, enjoy the tastings & various events, or buy a bottle or two to take home! Other Attractions – visit Byramine Homestead, Pioneer Historic Museum, and Tudor House Clock Museum. For the sports enthusiast - tennis, lawn bowls, yachting, aerobics and squash are all close by.